Eric Jeremy Edgar Dier (born 15 January 1994) is an English footballer who plays for Premier League club Tottenham Hotspur and the England national team. A versatile defensive player, Dier has been deployed as a defensive midfielder, a centre back and a right back. Dier grew up in Portugal, where he came through the youth ranks at Sporting CP, making his reserve and senior debuts in 2012 after a loan to Everton. In 2014, Dier moved to Tottenham Hotspur on a 5-year contract for a fee of £4 million. Despite interest from Portugal, he opted to represent England in international football. He made his debut for the senior team in November 2015, and was chosen for UEFA Euro 2016 and the 2018 World Cup. Born in Cheltenham, Gloucestershire, Dier moved to Portugal from England when he was seven years old, when his mother was offered a job running the hospitality programme at UEFA Euro 2004. With his parents and five siblings, Dier spent a year living in the Algarve region before moving to Lisbon. In 2010, his parents returned to England while Dier remained in Portugal, living at Sporting CP’s academy. Dier is the grandson of Ted Croker, a former secretary of The Football Association (FA) and president of Cheltenham Town, and great-nephew of Peter Croker, who both played professionally for Charlton Athletic. His father, Jeremy, is a former professional tennis player. While playing football at the International Preparatory School in Lisbon, Dier’s footballing ability was spotted by his P.E. teacher Miguel Silva, who referred him to Sporting’s scouts at the age of eight. Dier signed professional terms with Sporting in April 2010. The Portuguese club beat Arsenal, Manchester United and Tottenham Hotspur to his signature. Sporting also sold 50% economic rights of the player to a third-party owner, Quality Football Ireland Limited. Sporting bought Dier back in February 2012 by selling 50% rights of Filipe Chaby. In January 2011, Dier agreed to join Everton on loan until 30 June. Sporting CP’s official website stated that the loan was “an opportunity for the athlete to grow in a more competitive and demanding environment”. Dier represented Everton U18s ten times during his loan spell and won the 2010–11 U18 Premier League with the team. Dier encountered difficulties resettling into English life, but in the summer of 2011, he extended his loan stay in the Everton academy for an additional 12 months. On 26 August 2012, he made his debut with Sporting B in a 2012–13 Segunda Liga 3–1 away win against Atlético, replacing Diego Rubio in the 77th minute. On 4 November 2012, Dier scored his first senior goal with a direct free kick against Benfica B in a 3–1 away win in the Segunda Liga. On 11 November 2012, Dier was called to play for the first team in a Primeira Liga 1–0 home win against Braga, assisting Ricky van Wolfswinkel for the match’s only goal. Fifteen days later, he scored his first goal for Sporting’s first squad in a 2–2 league away draw against Moreirense. On 2 August 2014, he signed a 5-year contract with Tottenham Hotspur in a £4 million transfer. He made his competitive debut for the club on the first day of the 2014–15 Premier League season away to West Ham United on 16 August, and scored the only goal of the match in added time. Eight days later, in his second match and in his White Hart Lane debut, Dier headed in a corner from Érik Lamela in an eventual 4–0 win over newly promoted Queens Park Rangers. He started on 1 March 2015 as Tottenham lost the 2015 League Cup Final to Chelsea at Wembley Stadium. 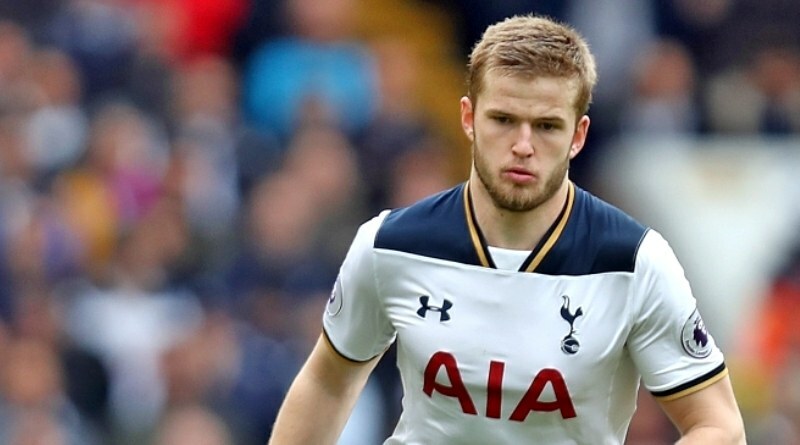 Dier signed a new contract on 9 September 2015, lasting until 2020. During the 2015–16 season, he was utilised as a defensive midfielder by Tottenham head coach Mauricio Pochettino, establishing himself as the regular partner to Mousa Dembélé as Tottenham challenged eventual champions Leicester City for the Premier League title. On 15 August, he scored Tottenham’s first goal of the Premier League season in a 2–2 draw at home to Stoke City, and on 26 September, Dier scored the team’s equalising goal in a 4–1 home victory over Manchester City. On 13 September 2016, Dier signed a new five-year contract to last until 2021. During the 2016–17 season, Dier returned to the centre-back position due to Tottenham’s acquisition of defensive midfielder Victor Wanyama and injuries to defenders Toby Alderweireld and Jan Vertonghen. He made his UEFA Champions League debut in a 2–1 loss to AS Monaco FC in Tottenham’s opening group match at Wembley Stadium. On 25 October 2016, Dier captained Tottenham for the first time in a 2–1 loss to Liverpool at Anfield in the fourth round of the EFL Cup. Dier was also given the captain’s armband for the 3rd and 4th round FA Cup ties against Aston Villa and Wycombe Wanderers respectively. On 1 April 2017, Dier scored his first goal of 2016–17 in a 2–0 win over Burnley in the Premier League. He had been approached by the Portuguese Football Federation to play for Portugal in the future, but could only do so once he turned 18. He had been involved in a high-profile England national team kit promotion for sportswear manufacturers Umbro, and his appearance in the campaign prompted British newspaper Daily Mail to question why The Football Association had not contacted him with a view for playing in their youth national teams. Upon his signing for Everton, an FA spokesman said, “Our intention will be to select him for the youth squad in the coming weeks,” referring to the 2011 edition of the under-17 international Algarve Tournament. Dier earned his first England call-up in November 2011 when under-18 head coach Noel Blake picked him for a match against Slovakia. He played the full 90 minutes in the 1–1 draw on 16 November 2011. On 28 May 2013, he was named in manager Peter Taylor’s 21-man squad for the 2013 FIFA U-20 World Cup. He made his debut on 16 June in a 3–0 win in a warm-up match against Uruguay. Dier made his debut for the England under-21s on 13 August 2013 in a 6–0 win against Scotland. In 2014, he pulled out of the squad, informing manager Gareth Southgate that he did not want to be deployed as a right back anymore and would rather work on the centre-back position at his club, Tottenham. On 5 November 2015, he was selected for the first time to the England senior team by manager Roy Hodgson ahead of friendlies against Spain and France. He made his debut eight days later against the former at Alicante’s Estadio José Rico Pérez as a 63rd-minute substitute alongside his Tottenham teammate Dele Alli in a 2–0 loss. He made his first start on 17 November against France, a 2–0 win at Wembley, and his performance was highlighted by former international midfielder Jamie Redknapp. On 26 March 2016, he scored his first international goal, heading Jordan Henderson’s corner for the winner in a 3–2 victory against Germany in Berlin. Dier was chosen for UEFA Euro 2016 in France. In England’s opening match against Russia at the Stade Vélodrome, he opened the scoring in the 1–1 draw through a direct free-kick. On 10 November 2017, Dier captained the England team for the first time in a friendly match against Germany at Wembley that ended in a goalless draw. He was named in the 23-man England national team squad for the 2018 FIFA World Cup, and captained the squad in the final group stage match against Belgium. He scored the decisive penalty in the second round match against Colombia, giving England its first ever World Cup shootout victory and first competitive shootout victory since Euro 1996. He is a versatile player, who can play as a midfielder, centre back and right back. It has been noted that his versatility enabled Tottenham’s effective adoption of a flexible approach, allowing them to switch system efficiently within a single match. He has decent pace, good heading and good mentality. He has said that he has mixed Portuguese and English style for his own. Another string to his bow is his fine free-kick taking. In 2018, ESPN’s Mark Ogden described Dier as “more of a destroyer than a creator”. Dier’s idols are Roy Keane and Rafael Márquez, who have inspired his playing style.